Conor Davis turns home the equaliser this evening at the Belfield Bowl. IRELAND U21 DEFENDER Liam Scales produced a moment of magic to create a goal for Conor Davis that earned UCD their first point of the season at home to St Patrick’s Athletic. Davis slid home from point-blank range after the defender – a target for champions Dundalk in the off-season – ran from his own half to the Pats box before teeing up an easy finish. Mikey Drennan had given the Saints the lead just before the half-hour mark with a smartly-taken volley to to leave keeper Conor Kearns with no chance. UCD have improved with each passing game back at the top level and looked every inch the side who threatened to stun Dundalk at Oriel Park on Monday night. They could have taken the lead midway through the first half as Dan Tobin cut back and curled in a cross for Davis, but Brendan Clarke got down brilliantly to turn away his low volley. Brandon Miele had the ball in the net shortly afterwards before being called back for offside, but it wasn’t long before the Athletic were celebrating a legitimate goal. Rhys McCabe whipped in a ball from the right and Drennan met the ball first-time and sent his volley flying into the top corner. Gary O’Neill had two efforts late in the half, a free kick that was deflected wide and a skied shot, but the Students’ confidence began to dip in the middle third. They worked their way back in, however, and equalised when Scales picked off a loose ball in his own half and strode forward purposefully before laying it on a plate for Davis. Rhys McCabe should have put Pats back in front when he was played through by Drennan but, in trying to round the keeper, Kearns was able to get a boot to the ball. 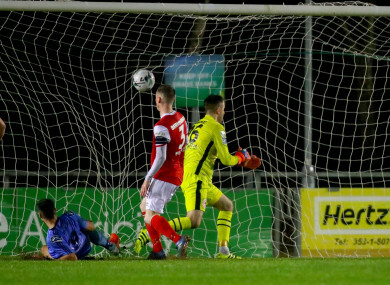 And Drennan could have sealed it as the Saints pressed late on as he rose to meet Chris Forrester’s cross, but he couldn’t quite make contact and UCD held on for a merited point. UCD: Kearns; Tobin, Scales, Collins, Dignam; Doyle (O’Farrell), O’Neill, Molloy; Farrugia, McClelland, Davis (Mahdy 81). St Patrick’s Athletic: Clarke; Madden, Toner, Desmond, Bermingham; Lennon, Clifford, McCabe ( Shaw 81); Miele (Doona 69), Forrester, Drennan. Email “Scales' moment of magic helps resilient UCD earn draw at home to St Pat's”. Feedback on “Scales' moment of magic helps resilient UCD earn draw at home to St Pat's”.